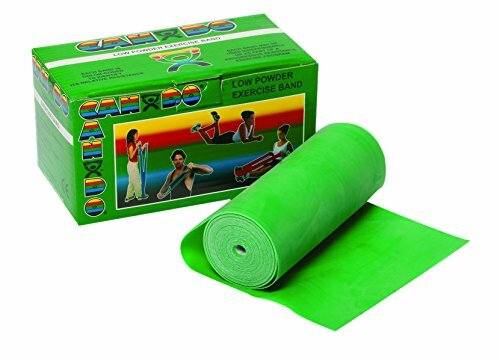 The CanDo Low Powder Exercise Band, 6 yard Roll, Green: Medium is conveniently packaged in a dispenser box. Simply unroll the desired length of exercise band from the box and cut with scissors to customize your resistance training workout. CanDo low powder exercise bands are made of natural rubber latex, which may cause allergic reactions. For those with latex sensitivities, there are latex-free alternative offerings of CanDo exercise bands. Each CanDo band is 5" wide and can be used with any band or tubing accessory to customize your workout. TheraBand colors licensed by Goldberg from Hygenic Corp without endorsement.